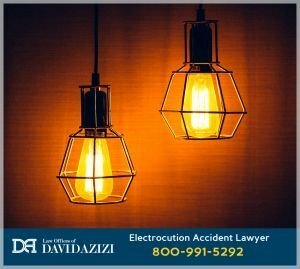 If you’re the victim of a shock injury, or if your loved one has died as a result of an electrocution in such an incident, please know that we at the Law Offices of David Azizi are truly sorry. David has worked with many electrocution shock injury victims and their families, and he has seen the pain that comes from such heartbreaking incidents. He also knows that on top of the intense physical and emotional suffering, there’s also the financial stress from medical and other expenses related to the accident. That’s where David’s expertise can be of great help. Whether you suffered the electrical injury yourself or you lost a loved one as a result of an electric shock, please call us at 800-991-5292 any time of day and any day of the week, 24/7. We’ll quickly get you connected with David to begin a free consultation. He will ask you about the circumstances of the accident, and he’ll give you a straight-up honest assessment of how much you could reasonably seek in financial compensation. We believe that there’s no electrocution injury lawyer in greater Los Angeles that’s more effective and trustworthy than David. He wins cases at an outstanding 98-percent rate, and his legal and litigation skills are so well-proven that he’s received superb endorsements and commendations from Expertise.com, the legal services corporation Avvo, and most recently for the sixth time, the prestigious Super Lawyers organization. David is also unsurpassed in his effectiveness at handling wrongful death cases. For more on his experience with, and approach to, wrongful death lawsuits, please also visit our wrongful death page. In one very tragic case, David was able to win a $3.1 million settlement for a young widow whose husband died in an electrocution accident. They had been high school sweethearts and married for less than two years when the accident occurred. As David explains, under California law, the owner of the strip mall was responsible for ensuring safe conditions on his property. His negligence lay in failing to make certain that the electricity in the sign was properly functioning. It is important to note that every case is unique, so settlement amounts vary. Call us today and David can discuss the particular details of your case with you. David personally handles every case and works on each with the same commitment, regardless of whether it’s a big or small case. He also goes above and beyond what other lawyers of his legal stature would do, giving each client his cell phone number whenever questions arise. Though David is tough as nails on the opposition, he feels genuine sympathy for each client. He has successfully won countless cases and as a married father of three young children, David especially feels it when a child is involved in the case. Given the financial stresses that his clients are already under, David also foregoes all payment until the verdict or settlement is won. If for some reason he’s unable to win your case, despite his 98-percent rate of success, you don’t owe him anything at all. He’s confident he’ll get you every dollar you deserve. Again, we welcome you to call us, just as soon as you’re able, at 800-991-5292. 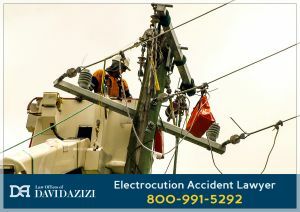 David is an outstanding electrocution injury lawyer, and he looks forward to hearing from you.